LEBANON, OH., January 14, 2014 – Doran Racing will field not one but two Nissan 370Z NISMO RCs in the 12-event IMSA Continental Tire SportsCar Challenge (CTSCC) in 2014, starting with the season opener Friday afternoon, Jan. 24 at Daytona International Speedway in Daytona Beach, Fla. Both cars just returned to the team’s headquarters in Lebanon, Ohio after participating in the series’ official pre-season test Jan. 3-5 at Daytona. The Tower Events No. 41 piloted by Canadians David Empringham and John Farano posted the fifth-fastest time for the Grand Sport (GS) class during the test. The team’s No. 14 car driven by BJ Zacharias of Cincinnati, Ohio and Brad Jaeger of Charlottesville, Va. was 13th fastest out of 23 class entries after six practice sessions on the 3.56-mile road course, just 0.684 of a second off its team car. Although the team is looking for two great finishes at Daytona, winning the CTSCC championship is it primary goal. Doran Racing has a rich history of winning championships and international races like the Rolex 24 that this race supports. It also has deep ties to Nissan Motorsports, dating back some 20 years. In addition, Zacharias drove the first Nissan 370Z in Grand-Am competition 11 years ago. The addition of the Tower Events No. 41 for the 2014 season only adds to the team’s arsenal. It not only gives it an additional car in the race, but it doubles the data the team can gather during testing sessions, further accelerating chassis setup. Empringham and Farano won the CTSCC championship in 2012 with another marque. Empringham also won title in 2005. He was part of the team that won the Rolex 24 overall in 2003, and he also has two Formula Atlantic and one Indy Lights titles. Farano, who like Empringham is from Toronto, finished second in the Ferrari Challenge series last year, winning that series’ race at Daytona. He and Empringham finished third in the CTSCC race at Daytona last year. Doran Racing only ran in five CTSCC races last year, but Zacharias and Jaeger finished third in the event at Mazda Raceway Laguna Seca in Sonoma, Calif. Last year they were in line for a top-five finish at Daytona until a gearbox issue thwarted their best efforts. Both have extensive experience as drivers of all sorts of race cars, and they have known each other for many years since both were raised in the Cincinnati area. Daytona is different than other facilities the series will visit this year since a good portion of a lap is spent on the oval with the throttle wide open. That poses special challenges for the nimble Nissan 370Z. All agreed that finishing the race is the first priority. Jaeger echoed his teammate’s goals. “Consistency is what we need!” he said. “The Nissan 370 NISMO is fast, and we just need to finish in the top five as much as possible. 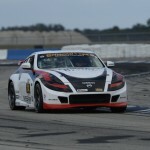 “Having Doran Racing at the head of this program and having the support of Nissan Motorsports is huge,” Zacharias added. “The expertise and knowledge that Kevin has and that he is able to put into the 370Z and this program are amazing. Practice at Daytona starts on Wednesday, Jan. 22. The GS class, which has attracted 29 entries, qualifies at 2:30 p.m. Thursday, Jan. 23. The 150-minute race is scheduled to get the green flag at 1:45 p.m. on Friday, Jan. 24. Live timing and scoring and other information will be available at imsa.com. The race will be broadcast on a same-day/tape-delayed basis on Fox Sports 2 beginning at 6 p.m. Eastern time. After Daytona the series will hold races at Sebring Int’l Raceway in Sebring, Fla. March 13-14; Mazda Raceway Laguna Seca in Sonoma, Calif. on May 2-3; Lime Rock Park in Lakeville, Conn., on May 23-24; Kansas Speedway in Kansas City, Kan., on June 6-7; Watkins Glen International in Watkins Glen, N.Y., on June 27-28; Canadian Tire Motorsports Park in Bowmanville, Ontario, Canada on July 11-12; Indianapolis Motor Speedway in Speedway, Ind., on July 24-25; Road America in Elkhart Lake, Wis., on Aug. 8-9; VIRginia Int’l Raceway in Alton, Va., on Aug. 22-23; Circuit of the Americas in Austin, Texas on Sept. 19-20 and Road Atlanta in Braselton, Ga., on Oct. 2-3.